Former Beatle Pete Best Makes Stage Debut In 'Lennon's Banjo' . Beatles Radio: The Beatles, Solos, Covers, Birthdays, News The Fab 4 and More! 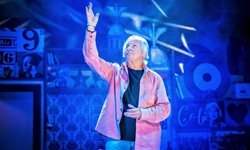 Pete Best, The Beatles’ original drummer, has made his dramatic stage debut in the new comedy Lennon’s Banjo, which had its world premiere in Liverpool on Wednesday (25) and has received rave reviews (photo: Anthony Robling). Best has played himself in two performances and will return for one more on the final night of the show’s two-week run at the Epstein Theatre on 5 May. Based on the 2012 novel Julia’s Banjo, written by Rob Fennah and Helen A. Jones, the play (directed by Mark Heller) depicts the quest for the missing banjo on which John Lennon was first taught to play music by his mother Julia. The banjo went missing shortly after Julia’s death.